Gavin Crowley scored the vital goal as Kerry, who finished with 13 players, earned a three-point win over Mayo at MacHale Park in Castlebar. The visitors held a 0-10 to 2-3 lead at half-time, although they could have led by more were it not for Diarmaid O’Connor two goals. But Crowley scored the crucial goal in the second-half. Despite two red cards for Ronan Shanahan and Gavin Crowley, and a late black card for Brian O Beaglaoich Kerry survived. They raced into a 0-2 to 0-0 early lead with Micheal Burns and Barry John Keane on target. It was an impressive Kerry forward unit and David Clifford could have found the net inside two minutes. But Mayo responded with a free from Evan Regan to open their scoring in the fifth minute and then Barry Moran tied the game up from distance. Then Kerry kicked three points in a row with efforts from Sean O’Shea, Barry O’Sullivan and Paul Geaney. Mayo regained their composure and they were level again in the 12th minute when Diarmaid O’Connor blasted low past Shane Murphy after a pass from Aidan O’Shea. 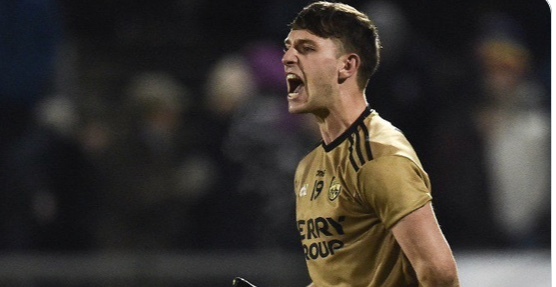 Kerry went back on the front foot and points from David Clifford, who then went off injured, O’Shea, Keane (two) and Burns pushed them 0-10 to 1-2 in front by the 34th minute. But Kerry did miss a penalty in the 24th minute when David Clarke did well to save from O’Shea. Mayo should have been further behind, but O’Connor scored another goal, this time from a penalty in the 35th minute. Jason Doherty added a free and Mayo were one point behind at half-time. But Crowley scored his goal three minutes after the break after a pass from Keane. And O’Shea and Geaney added two quick-fire points to push Kerry 1-12 to 2-5 ahead. Shanahan got red for a second yellow when he fouled Cillian O’Connor in the 51st minute. Crowley suffered a similar fate with 16 minutes remaining and despite a late O Beaglaioch black Kerry held on. Scorers for Kerry: Gavin Crowley 1-0, Barry John Keane 0-3, Sean O’Shea 0-3 (1 45), Paul Geaney 0-3, Micheal Burns 0-2, Barry O’Sullivan 0-1, David Clifford 0-1, Paul Murphy 0-1, Brendan O’Sullivan 0-1. Scorers for Mayo: Diarmaid O’Connor 2-1 (1-0 pen), Jason Doherty 0-3 (3fs), Cillian O’Connor 0-2 (2fs), Evan Regan 0-1 (f), Barry Moran 0-1, Andy Moran 0-1 (f). KERRY: Shane Murphy; Brian O'Beaglaoich, Jason Foley, Shane Enright; Paul Murphy, Gavin Crowley, Ronan Shanahan; Jack Barry, Barry O’Sullivan; Micheal Burns, Sean O’Shea, Stephen O’Brien; David Clifford, Paul Geaney, Barry John Keane. Subs: Jack Savage for Clifford (17), Brendan O’Sullivan for O’Brien (44), Andrew Barry for Keane (53), Matthew Flaherty for O’Shea (55), Eanna O Conchuir for Burns (59), Cormac Coffey for O Beaglaoich (66, black card). MAYO: David Clarke; Brendan Harrison, Ger Cafferkey, Eoin O’Donoghue; Barry Moran, Stephen Coen, Paddy Durcan; Jason Gibbons, Shane Nally; Kevin McLoughlin, Aidan O’Shea, Diarmuid O’Connor; Neil Douglas, Evan Regan, Jason Doherty. Subs: Caolan Crowe for Cafferkey (23), Cillian O’Connor for Regan (46), Andy Moran for Douglas (52), Colm Boyle for Nally (52), Fergal Boland for B Moran (63), Conor Loftus for Doherty (70+4).